Quality that measures up to customer demands is the norm in all manufacturing processes today, and the welding industry is no exception. Practitioners cannot ignore advances if they wish to remain competitive. This article reviews and analyzes some of the recent developments in the welding industry, with an eye toward their impact on the manufacturing engineer. Historically, the art of welding has changed more slowly than other manufacturing processes in its application of the latest technologies. But today, welders have many variables to consider. The sheer variety of materials is expanding daily and increasing the burden on welding personnel to stay abreast with technological innovations. The trend toward smaller and neater products has forced welders to be more accurate in their application of heat, both in the amount and location. Customer expectations continue to demand greater precision in the entire welding process. Precision welding is required for the manufacture of parts such as enclosures, batteries, capacitors, metal seals, pressure devices, sensors, surgical tools, and many other metal components. Because of the need to maintain part integrity, the sealing, shaping, or joining technique must be extremely reliable. The welding process must also be accomplished without detriment to the function or cosmetics of the part. Joined by an arc welding technique, this solenoid component has a pulsed arc finish on the weld surface. Many manufacturers are misled by the generally held belief that laser welding is "the most modern technology available," and therefore the only method for making precision welds or producing miniature parts. If secure in this belief, they may not consider alternative methods that can be much less expensive, and which make use of equipment that is much easier to operate. A new use of technology has recently emerged for short-duration spot welding of delicate parts. The plasma arc welding process, with its pilot arc always ignited between the welding electrode and copper nozzle, has always allowed for brief welds. But recent developments in fast-response power supplies, solid-state weld transfer contactors, and crystal timer controls (CTC programmers) have permitted total weld times of less than 0.005 seconds, with 0.001-second increments. This has opened an entirely new field of investigation that involves controlling the arc to give exceptional control. As a result, micro-components such as light bulb filaments, small wires, and thermocouple elements can be welded with near-perfect accuracy. When applied to larger components, the same technology can produce perfect welds on larger, thicker sections. In the manufacturing industry, the two most popular methods used for precision joining are the gas tungsten arc welding (GTAW) process--also referred to as the tungsten inert gas (TIG) process--and the plasma weld process. Both were originally developed to provide a means to produce acceptable weld quality on a variety of metal materials and alloys. Since then, advances in power supplies, welding techniques, and process controls have permitted greater weld accuracy. Today, the process is used in even more applications requiring precision and miniature parts. In the TIG process, an electric arc is established between a tungsten electrode and the part to be welded. To start the arc, a high voltage is used to break down the insulating gas between the electrode and the workpiece. Current is then transferred through the electrode to create and electrode arc. The metal to be welded is melted by the intense heat of the arc and fuses together. The plasma weld process is a variant of TIG welding: An additional copper housing around the electrode directs and further constricts the arc. Both processes use a tungsten electrode, ground to a point, as the source of the arc ignition and the means of energy transfer. The pulsed arc welding technique offers low heat input. It is used for welding thin components or metals next to a fragile material such as glass or polymer. In this technique, the arc welding current is rapidly increased and decreased. This makes a seam weld of overlapping spot welds, which reduces the overall heat input to the area and permits increases in weld speed. Welders can use the technique to great advantage with a combination of rapid response power supplies and weld process controllers. The result is improved weld quality and increased output. By examining more closely all the elements of the welding system, welders can reduce or eliminate many of the reasons why arc welding systems occasionally seem to develop a "personality of their own." Power supplies. The welding power supply itself has been refined. The method of delivering "brute force" power to a welding arc has become outdated as customers have demanded superior products. As a result, higher-performance machines with greater efficiency, accuracy, and response time have replaced the earlier version, sometimes known as "beasts." Welding control systems. In order to meet the more rigorous demands for quality, the welding industry has moved to a much stricter control of standards. It has also witnessed the development of weld programmers--devices that store and execute welding programs. In addition to automating the welding process portion of the work, these programmers/controllers help reduce scrap parts by executing repeatable, pre-arranged weld programs within precise welding parameters. The welding capability is thus built into the system through the controller, as opposed to being taught to the manual welder. A positive result is that less opportunity exists for error or fatigue. Besides improving weld quality and consistency, weld controllers offer lower operating costs. Manufacturers and job shops use the controllers for medium-to-large contract runs. Lower costs are derived mainly by limiting the skill requirements of an operator to the level needed for loading and unloading parts. Although repetitive welding is accepted as an operation to be automated, the need for a skilled welder will always exist. Here, too, manufacturing firms and job shops have found ways to improve output. The tungsten welding electrode, the source of the welding arc, may be the most important element of the welding system to be commonly ignored by manufacturing organizations and job shops. While no one would refute the importance of the ignition device and an automobile airbag, the rip cord for a parachute, or quality tires for out automobiles, the importance of tungsten electrode for quality welding is often overlooked. This is an area where manufacturing firms and job shops can increase the consistency of their welding output with minor effort. To achieve highly consistent welds, it is essential that electrode dimensions be held to close tolerances. In addition to restricting welding current, crosswise grinding (left) causes arc ignition problems and arc wander. The proper technique is longitudinal grinding (right), which improves welding current flow. 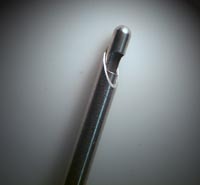 Safety issues associated with the tungsten electrode material are also being examined more closely. Many users of the Tig and plasma welding processes fail to realize that the welding electrode that they are using contains Thorium, a radioactive element added to the tungsten material to improve arc starting and welding characteristics. Although the level of radioactivity is low, it raises the issue of danger, especially with regard to radioactive dust generated when grinding the electrodes to a point for welding. Today, new tungsten materials are commercially available, such as Lanthanated electrodes. They offer superior arc welding characteristics and are safer because they lack radioactivity. Despite their availability, however they have been largely ignored. Given the radioactivity issues associated with Thorium electrodes, and the ever-increasing quality requirements of the final weld, many companies are searching for ways to ensure that their weld quality is up to par. Consistency and repeatability are the keys to welding applications. 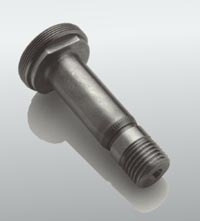 Finally, the shape and quality of the tungsten electrode tip is being recognized as an important process variable. Once a weld procedure has been established, it is important that a consistent electrode geometry and surface condition be used. By using electrodes pre-ground to requirements, or a dedicated commercial electrode grinder for quality and consistency of the electrode tip, welders can obtain numerous benefits. These include improved arc starting, increased arc stability, and more consistent weld penetration; longer electrode life before wear or contamination; and reduction of tungsten shedding, which minimizes the possibility of tungsten inclusions in the weld. A dedicated electrode grinder helps ensure that welding electrodes do not become contaminated by residue or material left on a standard shop grinder wheel. Also, tungsten electrode grinding equipment requires less skill to ensure that the tungsten electrode is ground correctly and with more consistency. Spot welding. J&J Precision, of Thomaston, Connecticut, took on a contract that involved sealing the end of small tube diameters. The firm is a contract manufacturer of eyelets and performs stamping, forming, machining, grinding, and assembly of precision metal components. The firm's owner, John Maxwell, investigated the latest arc welding technology not as a joining, but as a heating and sealing procedure. By using a specialty arc welding system with very short weld times, Mr. Maxwell was able to seal the tube by momentarily imposing a welding arc on its ending. This melted the tube and produced a smooth hemispherical surface. He currently uses the same technology for rod and wire end rounding, welding of custom endings to tubes, and creation of ball endings on wire. By imposing a welding arc for a controlled period of time, welders can close small diameter tubes to a perfect hemisphere. Seam welding. In a similar manner, many job ships have used semi-automatic welding equipment to fulfill contracts that involve much repetitious welding for sensors, or welding of floats, circular enclosures and canisters, and fittings to tube endings. Instead of employing manual welding with its high labor costs and issues of quality, consistency, and availability of skilled practitioners, job shops have invested in a precision power supply, welding lathe, and welding controller. With these systems, an operator manually loads the parts into the welding fixture. A weld controller then controls the part rotation motion and welding parameters to ensure a quality, repeatable weld. After the weld is completed, the operator removes the completed part and the process begins again. In addition to providing favorable weld quality, the systems increase output, decrease scrap and rework, and reduce operating costs with easily available labor. Suitable applications for these welding systems include repetitive welds on identical parts, quality or critical-function welds, and parts with significant accumulated value prior to welding. If a firm has sufficient contracts and a flexible welding system, the total cost of the welding system equipment usually can be paid within six months. Modern technology has revolutionized production operations. Progressive companies that aim at a local, national, or global market are searching for methods and approaches that increase output, consistency, and quality. For a company to increase its share of the market, or even to remain competitive, it must improve its efficiency and methods of production. Though it has sometimes been lethargic in response to change, the welding industry currently offers exciting opportunities for improving weld quality and increasing production. To test where new technology is progressing can result in improved products with increased profits. Elderfield & Hall / Pro-Fusion is a firm that specializes in assisting companies in the welding industry. The company manufactures and supplies welding products such as pre-ground welding electrodes, Sharpshooter tungsten electrode grinders, and plasma welding torches. Recently, the firm introduced a welding website, some 75% of the site is devoted to providing information on welding technology and educating users on how to apply it to various applications. Information is available on tungsten electrode materials, welding processes and their uses, weld application data, software for developing pulsed arc welding parameters, and troubleshooting welding systems.